England pace bowler James Anderson launched a scathing attack against former captain Michael Vaughan in his new book Jimmy: My Story. 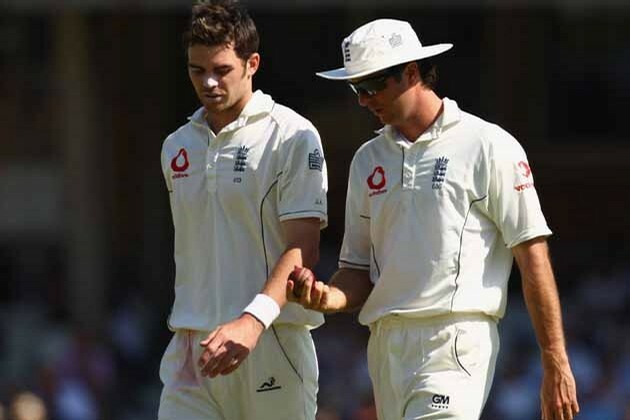 Anderson criticised Vaughan about the 2005 Ashes campaign, stating that the former captain did not have the ability to talk to individual players and as a result Anderson claims that he felt “alone and isolated” when he was in dire need of support from his captain. In his autobiography, Anderson also talks about his relationship with Nasser Hussain, who was another former England captain. “My relationship with Nasser was good on and off the field. The same could be said of my relationship with Michael Vaughan, captain during my early England years, since his retirement. Unfortunately, despite our cordiality now, I didn’t enjoy Vaughan as a captain,” Anderson said. “As a young fast bowler, you need to know that your captain has his arm around your shoulder, if not physically, then metaphorically. Unfortunately, that is not something I ever felt playing under Vaughan. I actually felt alone and isolated when I most needed support,” Anderson added. Anderson highlights just how dejected he felt during the 2005 series against South Africa, whereby all the attention seemed to be on Simon Jones while he was just cast aside to the shadows. “Prime example of that was my recall for the fourth Test against South Africa at the Wanderers in 2005. I had spent the first three Tests on tour out of favour. My tour was one big net, and because I had been so far removed from selection, I wasn’t even thinking about playing. When preferred to Simon Jones, I was underprepared. It was five months since my last first-class action. I didn’t bowl very well. Although I started okay as first change, it wasn’t long before I began dragging the ball down short and wide. I got clattered everywhere and was soon shot of confidence,” Anderson said. The England pace bowler went on to state how Vaughan had not supported him during the match. “Vaughan asked: ‘What’s up, mate? Radar gone?’ ‘Yeah, I think it has,’ I said, desperate for some backing. All I received was a pat between the shoulder blades and an instruction to ‘keep going’,” Anderson added. Anderson was also disgusted by the fact of how Vaughan was held in such high regard when in fact it was all down to the outstanding performances of the entire team. “A good captain should know how to talk to his team as individuals. I don’t think Vaughan ever had that in him – a major reason I’ve not held him in as high regard as others have, he was not as good a captain as others made out. He was captain of a truly great team in 2005,” Anderson said. This entry was posted in Uncategorized and tagged 2005 Ashes, alone, attention, cricket, England, entire team, high regard, isolated, James Anderson, Jimmy: My Story, Michael Vaughan, Nasser Hussain, performances, scathing attack, Simon Jones, South Africa, support. Bookmark the permalink.